.. demographic-economic patterns and characteristics can often be “masked” when using larger geographic areas such as counties and metros. Using data for small area geography such as census tracts and block groups can help identify clusters and areas of interest. Now, demographic-economic data for block groups (217,000 areas averaging 1,200 population covering the U.S. wall-to-wall) are tabulated annually from the American Community Survey (ACS). There are hundreds of subject matter items updated annually. Without specialized tools, it is very difficult to navigate through the maze of small area data that are available and make effective use of these data for analysis and decision-making. 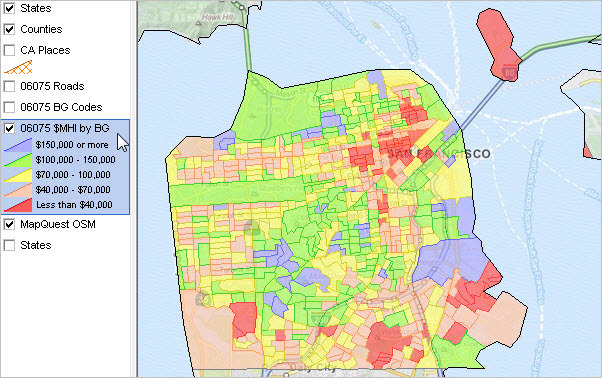 Use the combination of API tools and GIS tools described in this Web section to visually and geospatially analyze demographic-economic characteristics of block groups. Covering the U.S. wall-to-wall and averaging 1,200 population, block groups are the smallest geographic tabulation area for data from the American Community Survey (ACS 5-year estimates). Block group (BG) data are also available from Census 2010 Summary File 1 (SF1) for the same block group area geography. Create map views similar to the one shown here for your areas of interest. … Click graphic for larger view. View developed using CV XE GIS. 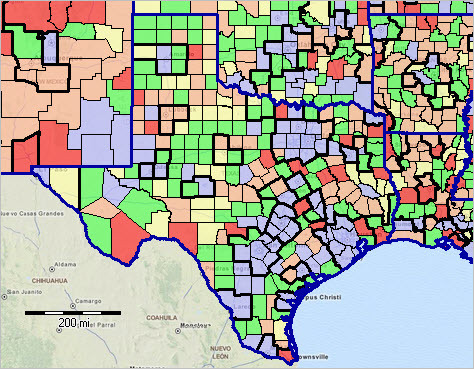 There are two software tools involved to create maps such as the one above for any county in the U.S. using block group level data for multiple years, flexibly choosing among more than a thousand subject matter items. Steps to use two tools are described in this Web section. You can perform these operations for any area in the U.S. and use the resulting maps and data in any manner. See the corresponding Web sections above to install the Windows-based software. There is no fee to use these tools to perform operations described here. There are no block group subject matter datasets to download. The steps to use these tools are summarized here. 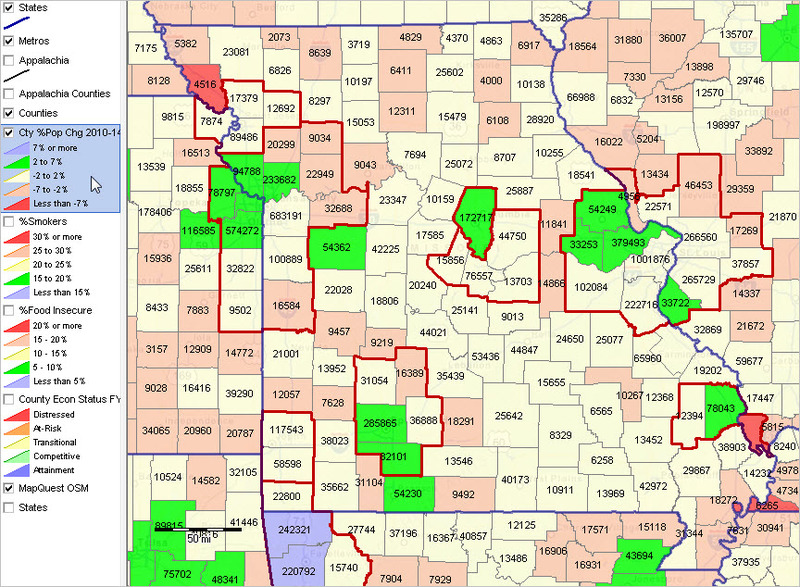 The flexibility and breadth of data selection options afforded by access to thousands of subject matter items from multiple statistical programs requires several steps to use the data in GIS applications. Join us in a Data Analytics Lab session for additional assistance. We can go through/discuss any aspect of steps summarized here. There is no fee for the Data Analytics sessions. .. new July 1, 2014 Census Bureau model-based estimates for the U.S. 19,509 incorporated cities show a total population of 200,158,492 compared to 192,191,138 as of Census 2010 (an increase of almost 8 million or 4.14 percent). These areas are incorporated cities as recognized by their corresponding state governments and granted certain governmental rights and responsibilities. The increase of almost 8 million in city population reflects a 4.2% increase over the little more than 4 years. The population change includes areas annexed by cities since 2010 and includes some cities that did not exist as of Census 2010. See related Web section for more detail on topics covered here. Use the CV XE GIS software with city/place GIS project to examine characteristics of city/place population, 2010-2014. 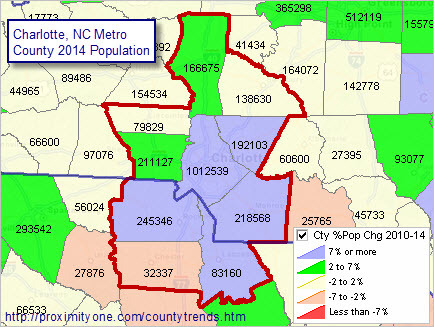 The following view shows patterns of population percent change, 2010-14, by city in the Charlotte, NC/SC metro area. Create custom maps similar to this map for any city/place/area. Create your own intervals and color patterns. Select from alternative demographic measure. Add your own data. Use the interactive table to view, rank, query and compare cities of interest. The following graphic shows North Carolina counties ranked in descending order based on the 2014 population estimate. Use the interactive table to create a similar view for states of interest. … click graphic for larger view. View the list of cities with the largest 2014 population by dbl-clicking the header cell “Population 7/1/2014” in the table. Place a state query on the table to select cities in a state of interest and click the header cell “Population 7/1/2014” to view cities in that state ranked by size. Choose other columns to view other relationships. The following sequence of graphics illustrate use of the interactive table to examine characteristics of cities having 2014 population of 100,000 or more. The first step was to set the 2014 population threshold at 100,000 using the tools below the table. Choose your own population threshold (any value). Next, click the Population 2014 header cell to rank these cities in descending order on this measure. To view the largest cities (100,000 or more population in 2014) ranked on population change 2010 to 2014, click the population change header cell. The result is shown in the following graphic. To view the largest cities (100,000 or more population in 2014) ranked on population percent change 2010 to 2014, click the population change header cell. The result is shown in the following graphic. The America’s Communities Program database will updated soon to reflect these updates. Examine the annual population estimates in context with other demographic-economic measures and patterns. Join us in a Data Analytics Lab Session where we review and discuss use of tools and resources like those covered in this section. .. as the population ages, migrates and otherwise changes, health status and healthcare needs change by location, type and in other ways. Data on health status, characteristics and trends continue to become more available, particularly at the county geographic level … but these data are often difficult to locate, integrate and use in a combined manner. This section provides an overview of accessing, integrating and analyzing demographic, economic and health data with a focus on county and sub-county geography. Geographic information system (GIS) tools are used to visually and geospatially analyze health-related patterns and characteristics. Applications reviewed here are developed using the CV XE GIS software and associated U.S. national scale health GIS Project. See more detail in the related Web section. The following view shows patterns of %population change 2010-2014 using the CountyTrends layer/dataset. This view also illustrates use of the Site Analysis tool to aggregate and display population by year 2010 through 2014. The following view shows patterns of %population change 2010-2014 using the CountyTrends layer/dataset. This view also illustrates use of the Metros layer to show outlines of Missouri metropolitan statistical areas (bold red/brown boundary). Counties are labeled with the 2014 population estimate. 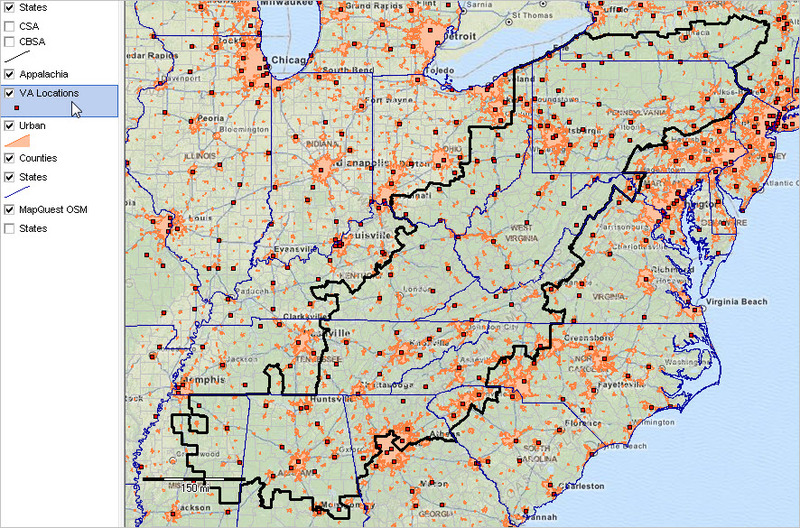 The following view shows patterns of percent smokers by county using the County Health Rankings RMD layer/dataset. Choose from a list of wide-ranging health-related subject matter items. The following view shows patterns of food insecurity by county using the County Health Rankings AMD layer/dataset. Choose from a list of wide-ranging health-related subject matter items. The following view shows patterns of economic distress based on an index developed by the Appalachian Regional Commission. Economic characteristics of an area can have a direct impact on health and well-being and access to healthcare resources. An upcoming section will review more detail about analyzing regional health and healthcare issues with drill-down to census tract and other sub-county geography. Join us in a Data Analytics Web Session where we review and discuss use of tools and resources like those covered in this section. 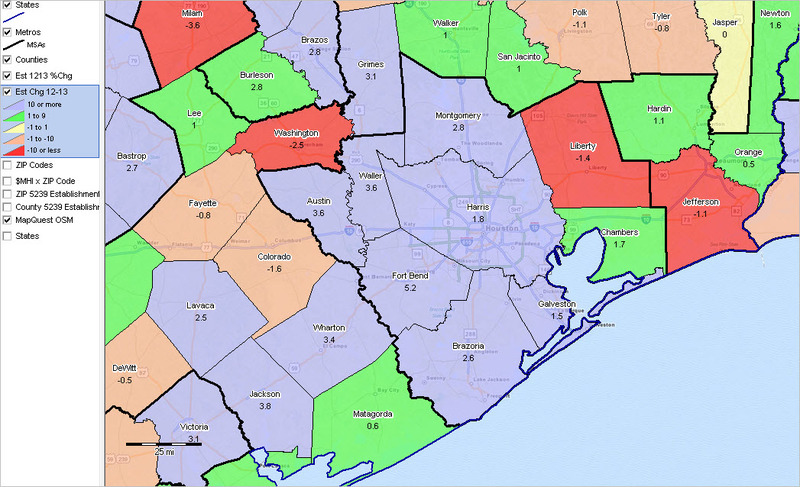 .. new/updated annual county population estimates … counties, and county equivalent areas such as independent cities, are the primary political subdivision of states. The relative stable geography of counties, with good national scope geographic granularity, makes these areas appealing for use in tabulating data as well as analyzing data. 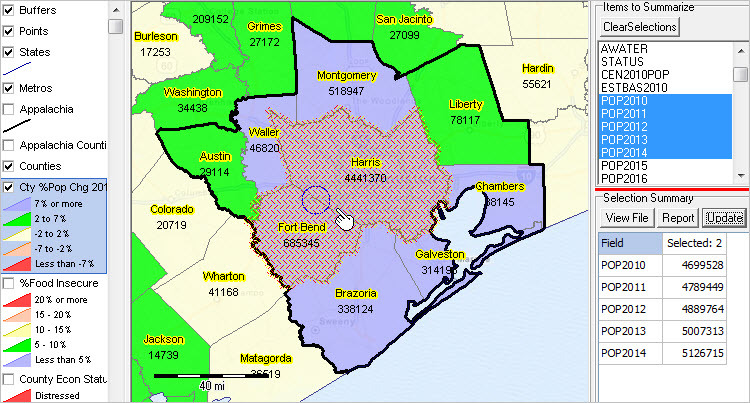 This section provides information on tools and data related to accessing, integrating analyzing county demographic-economic patterns and trends focused on the latest official county population and components of change estimates (through 2014, released March 2015). See related Web page for more details. The following view illustrates use of Geographic Information System (GIS) tools to visually examine demographic characteristics of Charlotte-Concord-Gastonia, NC-SC MSA region by county. The thematic/color pattern shows percent population change 2010-2014. Labels show county 2014 population. Develop this type of view for any metro or region. See the Metro Profile for this metro. See more about metros. Click on a metro link in the in the metro interactive table to view a similarly structured profile for any metro. 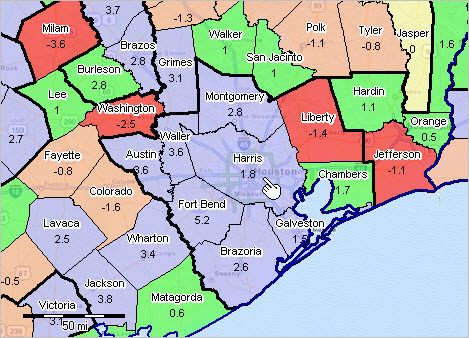 Annual population and components of change estimates for each county, 2010 though 2014, are included in the dataset used in the create the map shown above. Similar thematic pattern maps can be generated for any county/region for any of these items, or computed items such as birth rate. Use the interactive table in the related Web section to interactively view, rank, compare annual population and population components of change for all states and 3,143 counties. For counties that are part of a metropolitan area, the table includes the new and previous metro (CBSA) codes. 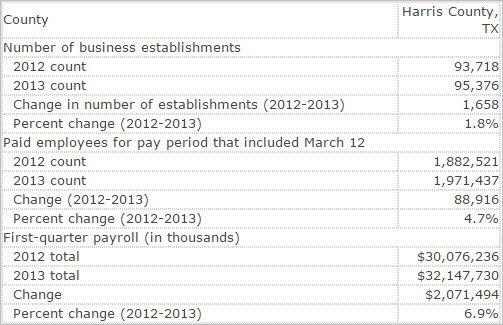 The following graphic illustrates use of the interactive table. 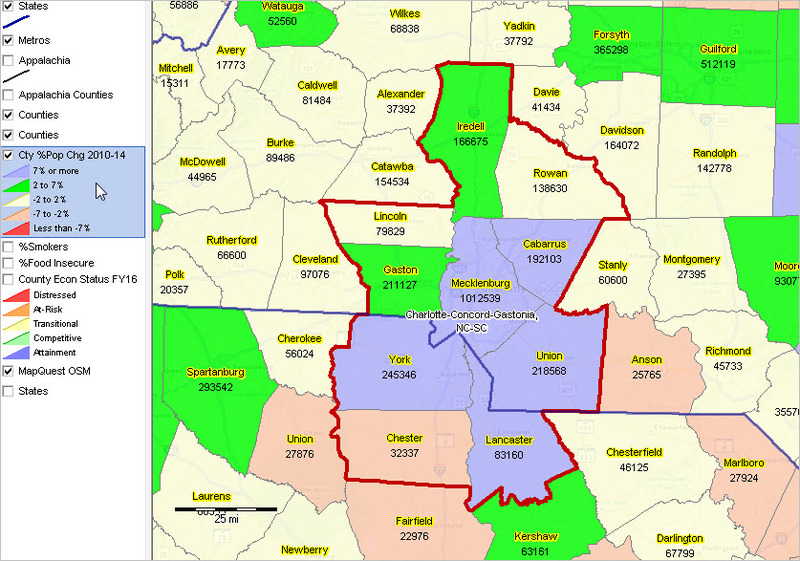 A query is used to view only those counties in the Charlotte metro. These rows/records are then sorted (dbl-click column header) on the Census 2010 population. It can be seen from the table that Mecklendurg County has the largest Census 2010 population (919,628) and the metro Census 2010 total population is 2,217,012. Click on the Mecklenburg County link in the interactive table to view an extended profile for the county (available for any county) as shown below. Use the interactive table and click on a county link to view a similar profile for county(s) of interest.